Young Ragman Toby flees his home in the town of Maremount via a fast working spell that changes him into the form a crow to escape the invading evil necromancer Rawhed. At the other end of his journey lies the boarding school known as Mather Academy, set in the present day city of Boston, which shared its roots with Maremount until the two cities were separated by powerful wizards. Maremount and Boston now exist in separate, but related planes and share similar fates. Toby, back in his human form, joins the students at Mather Academy, safe, but alone. He quickly settles in to life at the Academy and sets about gathering a plucky group of friends. By teaching them the spells he has learned as a Ragman he attempts to create a new coven in Boston in the hopes that they will be enough to protect Mather Academy from the onslaught of evil on the horizon. Soon enough, darkness, ghosts and magical happenings begin to disrupt life at the Academy, and Toby is quickly singled out as the harbinger of bad events. Only he knows the truth of what is coming and when the foreboding Witching Elm reappears, Toby realizes that it is up to his new group of friends to help him discover a way to protect both Mather Academy and Boston from Rawhed and his evil undead army. Quite the dark and gritty YA urban/alternate history fantasy story! 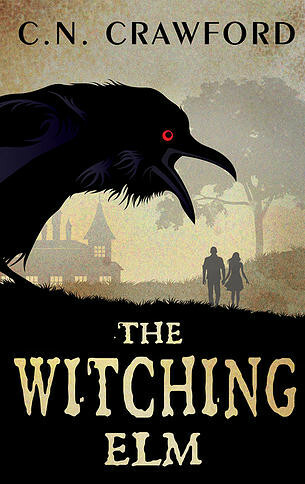 I was expecting a leisurely kind of ‘stranger in a new milieu’ story, but instead The Witching Elm throws the reader right into the danger, death and action and barely lets up its pace throughout. Initially, I was a tiny bit confused because many of the secondary characters are introduced in one big lump and it was a bit of challenge keeping them straight for a while, but they grow and develop as the story churns on, until—for the most part—they evolve into fully developed characters. I found the passages on New England’s dark history fascinating and I don’t think it drags on or becomes too boring for the average YA reader to get through. In fact, it adds to the richness of the storyline with layers of mythos and creepiness. Several of the characters, like the introduced-late researcher and almost professor Thomas Malcolm, were incredibly well-written as vital and interesting secondary characters that I felt deserve whole stories of their own. Although I’m not convinced poor Toby was the best choice for POV character, since the story seemed to move ahead more quickly when he was relegated to teaching spells or giving back story, but I think from a YA perspective Toby puts in a calm and measured storyline as the most ‘relatable’ character. One of the things I enjoyed the most about The Witching Elm is how much love and attention to detail CN Crawford has placed in research. It’s not often that a brand new indie author (actually two authors in this case) devotes so much energy to adding just the right amount of scary facts and tidbits to their prose to make both the historical New England of the past and current Boston come alive on the page. Even the ghosts have a significant back story! A great dark urban fantasy for mature YA, I am definitely looking forward to more of the Memento Mori Series! 7 Who is your favorite author and how has s/he influenced your novel? It’s hard to chose a favorite, but I think maybe Peter Ackroyd is up there. He writes both history and fiction books. The way he describes London sort of overlays the modern with the past. That’s something I hoped to incorporate to The Witching Elm, so the reader feels that they’re not just getting a tour of Boston, but of how the city evolved over time. 18 One tip for publishing a book? People generally give two types of advice. One is to read a lot, and the other is something along the lines of “just sit down and write.” Those are both important, but I think the third thing burgeoning writers need to do is to get lots of feedback, and to be open-minded about people’s responses. None of us are like Mozart in Amadeus- we’re not going to sit down and just vomit out something genius. It’s annoying, right? But you don’t notice it as a beginning writer because you’re so caught up with trying to make the plot make sense or trying to understand pacing. So that’s where other people’s feedback comes in. You need someone to tell you it’s stilted, boring, confusing, and so on. *not a real part of my book. 6 What has been the toughest criticism given to you as an author? With the early drafts, I’d showed them to friends and they were kind of like, “yeah… you should read more of some other books first.” That might be why it took four years of revising. The problem was not really a lack of reading, but it was more just grappling with learning technical aspects of writing. You pick up a feel for language through reading, but I don’t think you notice things like pacing, word variation, and so on unless they’re done poorly. Characters were simplistic at the start because all our attention was on things like “how do I describe a character’s background without a giant info dump at the start?” Four years later, I’ve smoothed that out, and the characters had become much more complex as well. I read the short story The Dragonfly, which is a prequel to The Witching Elm, and just from those few pages I knew there was going to be an interesting and well-thought-out story in the novel proper.